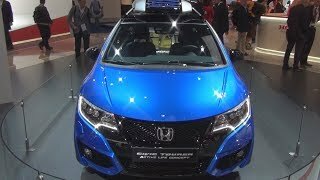 At the Frankfurt Motor Show 2015, Honda proved with its Honda Civic Tourer Active Life Concept 2016 that there couldn’t be any other model that maintains balance between terrific looks and remarkable interior. Housed with a remarkable engine the concept has everything that will make it steal the gleam. Let us have a closer look at the specifications and performance of Honda Civic Tourer Active Life Concept 2016 to know more about it. The interior of Honda Civic Tourer Active Life Concept 2016 is too much concept-like. Starting with the cabin the seating arrangement remains unchanged apart from the upholstery which gets the black suede with blue accents and stitching. The suede further makes it into the door lining and compliments the arena. The essence of blue stitching also can be noticed at the gear lever and steering wheel while the black headliner joins the league by making the interior resemble to the iconic Civic Sport and Honda-Civic Type R 2016. Moving towards the rear part of the interior you’ll notice an entire new world. The model gets a unique center-mounted fuel tank which allows more space and a lower load height. The space has been very well utilized by filling it with a bike rack; this implies bike expeditions are now friendlier. In all rounding up the interior details of Honda Civic Tourer Active Life Concept 2016 I would say it is innovative, catchy and spacious. 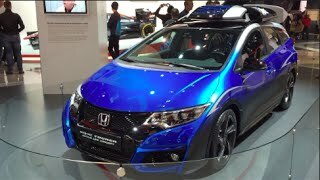 For the exterior of Honda Civic Tourer Active Life Concept 2016 I would say it is a gorgeous station wagon which has a set of wheels and a special paint job that makes it unique in comparison to the 2014 Honda Civic Tourer. Talking about the blue with gunmetal in the lower portions paint job the set up steals the gleam and gets further complimented by a silver roof. Roof comes with a mounted luggage box that adds some extra space for your cargo like, helmets, shoes and other minute things which might bother you if kept inside. 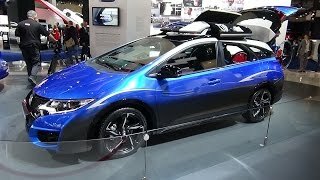 Rounding up the entire exterior details of Honda Civic Tourer Active Life Concept 2016 all I would say is, despite of no new design change the new set of wheels and the paint job makes the model stand ahead in segment. 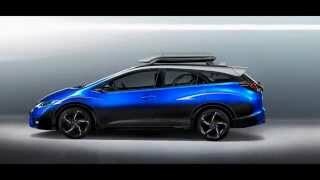 Beneath the hood of Honda Civic Tourer Active Life Concept 2016 will be a 1.6 liter i-DTEC diesel engine however the non-concept version will also have the option for a 1.8 liter gasoline engine. The performance figures Honda Civic Tourer Active Life Concept 2016 are still not shared but expect something that will rule the streets without ruining your pocket; the credit for this undoubtedly goes to the former engine which is also a Guinness World Record Holder for its fuel economy stats.